I made this recipe up after seeing “halloumi kibi” on The Gate’s menu. I googled some tikka recipes to find one that sounded right and worked out the rest. First, make the marinade. 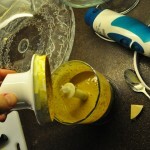 Whizz up all the ingredients together; I used a HC Chopper attachment for the Braun handblenders. Then slice the halloumi whichever way you like so it ends up in appx 2cm by 2cm pieces about 0.5cm thick. Dab the marinade over the halloumi with a pastry brush. Slice the courgettes into rounds about 1cm thick. Chop the red onion roughly so you end up with 2cm by 2cm or so pieces that are at least 3 layers thick. Roughly chop the pepper. 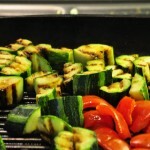 Brush a griddle pan with vegetable oil and griddle the courgettes, onion and pepper, in batches if necessary. When all are nicely charred, brush on the tikka marinade and cook for a further few minutes. Cook the marinaded halloumi in a frying pan, flipping so both sides are nicely browned. 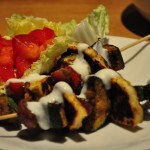 Assemble the kebabs on barbeque skewers and serve immediately. Drizzle with yoghurt and lemon juice, or let your guests do this themselves. Great with salad, tabbouleh/couscous.